Confession Time: Even though I love eating them, I’m not really known for baking desserts, so I rely on easy-peasy sweets that anyone can master. 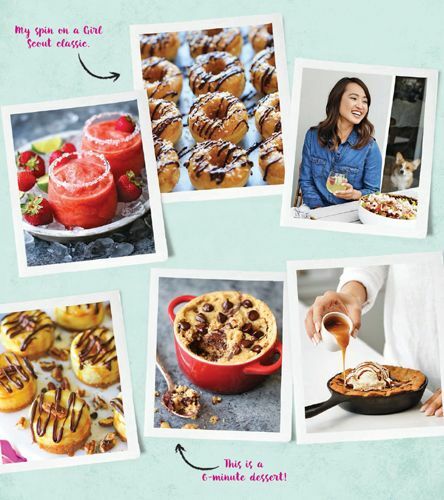 Here are sips and bites that are irresistible but simple to make—because who can wait before getting to all the awesomeness? I have been making a daily stop at my local coffee shop for their mint mojito iced coffee ever since I moved back to Los Angeles 3 years ago. It may just be the best cup of coffee I’ve ever had, but $4 per cup can start to add up! Fortunately for my wallet, I’ve figured out how to make a version at home with just a few ingredients. You can use your favorite kind of coffee, adding in more or less sugar to suit your taste preference. Easy and cheap enough, right? 1. Using the back of a spoon, pound the sugar and mint leaves together in a 12-ounce glass until fragrant, 1 to 2 minutes. 2. Stir in the hot coffee until the sugar has dissolved. 3. 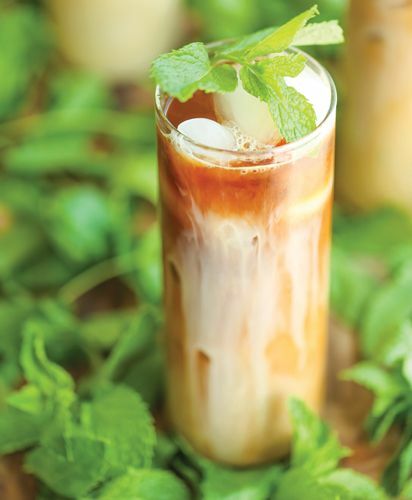 Serve immediately over ice, topped with the heavy cream and garnished with a mint sprig, if desired. Skip the store-bought cocoa mix: Homemade hot chocolate is easier to make than you think with just a handful of ingredients that are already sitting in your pantry. And this adult version—with a hint of Kahlúa—is an extra-special treat, especially during the holiday season. 1. In a medium saucepan, combine the milk, sugar, cocoa powder, cinnamon, and nutmeg over medium heat; stir until the milk is heated through and the sugar has dissolved, 2 to 3 minutes. Remove from the heat, and stir in the Kahlúa. 2. 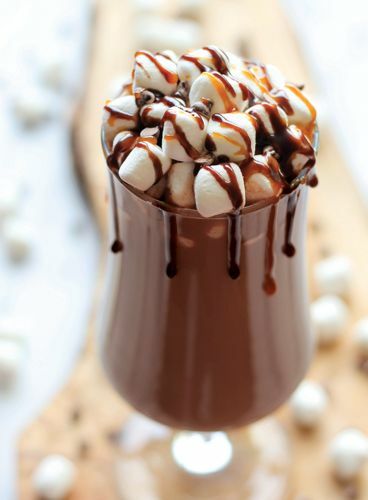 Serve immediately, garnished with mini marshmallows, salted caramel, and/or chocolate syrup, if desired. Wonderfully refreshing, bubbly, and sweet, you can make this exceptional cocktail in minutes to impress the guests at your next party. Swap out the raspberries for strawberries, blueberries, blackberries—or a combination of all three! Just be sure to let the berries freeze for at least 30 minutes so they will keep your drink chilled. 1. In a large pitcher, whisk together the Prosecco and limoncello. 2. 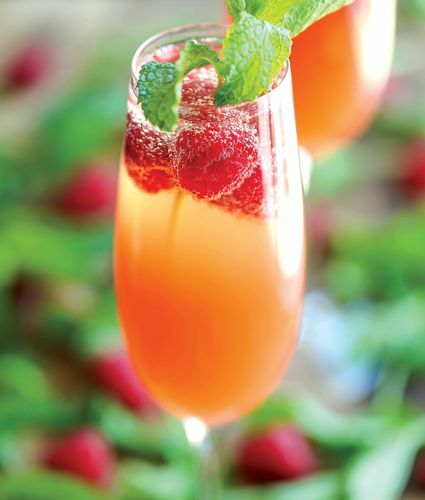 Serve over the raspberries, garnished with mint sprigs, if desired. The freshly squeezed grapefruit juice adds a fun splash of color to these easy mimosas. 1. Pour the grapefruit juice into champagne flutes until half full. Top off the glasses with the white wine. 2. Garnish with the raspberries, and serve immediately, with mint sprigs, if desired. Enjoy this refresher all summer long. Feel free to play around with the recipe, swapping out the strawberries for raspberries, blackberries, or even chunks of mango for a tropical twist. Whatever fruit flavors you choose, you can’t go wrong with a frozen margarita! 1. 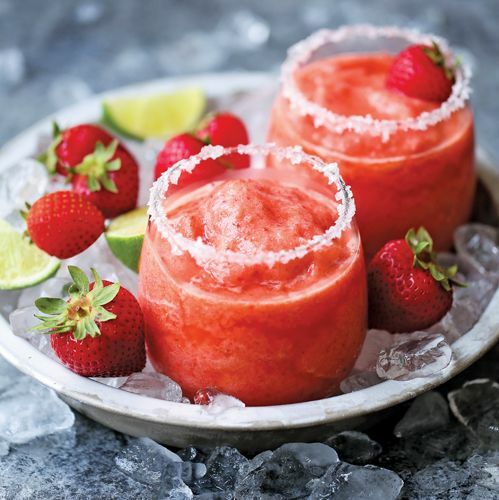 In a blender, combine the strawberries, pineapple, tequila, triple sec, sugar, if using, and the lime juice with 2 cups ice, and puree until smooth. 2. Serve immediately. Garnish the rims of serving glasses with salt, if desired. Store-bought margarita mixes are nothing more than sugar and food coloring. They don’t hold a candle to the real fruit in this recipe. This is a quick summer treat—all you need is a blender, three ingredients, and five minutes. For a grown-up version, you can add a splash a vodka. 1. 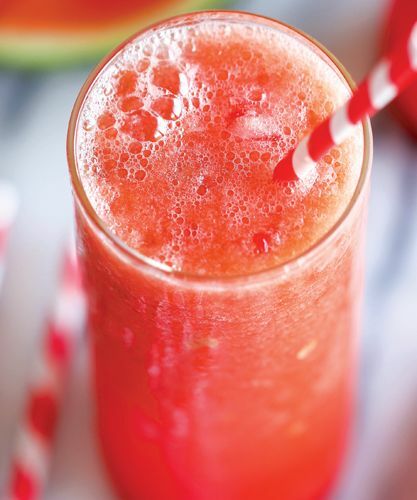 In a blender, combine the watermelon, sugar, lime juice, and 1 cup ice, and puree until smooth. Watermelons are more than 90% water, perfect for hydration on a hot day. They’re also a great source of vitamin A and vitamin C.
Homemade fro-yo is easy to make, seriously refreshing, and best of all, totally guilt free. 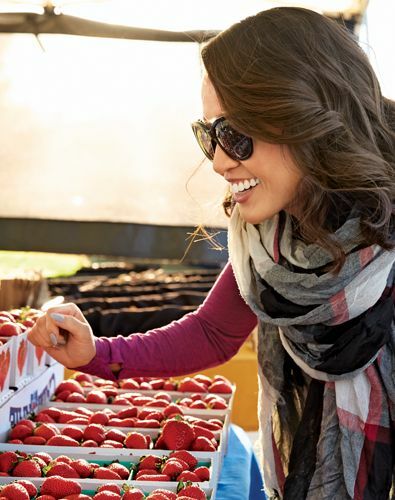 If you don’t have strawberries on hand, swap in other fruit such as pineapple or cherries. For an adult version, add a tablespoon of rum to the mix. 1. In a blender, combine the strawberries, bananas, yogurt, sour cream, sugar, lemon juice, and vanilla, if desired, and puree until smooth. 2. Pour the mixture into the bowl of an ice cream machine, and freeze according to manufacturer’s instructions, about 25 minutes. Transfer to a freezer-safe container, and freeze until ready to serve. Note: While fat-free yogurt can be substituted, whole-milk yogurt will yield a richer and smoother texture. Greek yogurt can also be substituted for the whole-milk yogurt. If you don’t have an ice cream machine, don’t worry. Start with frozen fruits, and then transfer everything to a freezer-safe container and freeze for a few hours. 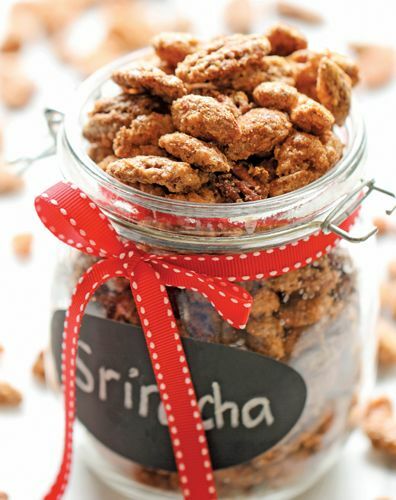 A hint of spiciness along with the sweet make these candied nuts oh-so addictive. These are also perfect for a budget-friendly edible gift. Fill a jar and wrap a cute ribbon around it—your friends will thank you. 1. Preheat the oven to 300°F. Line a baking sheet with parchment paper; set aside. 2. In a small bowl, whisk together the egg white, Sriracha, and 1 tablespoon water until frothy, about 2 minutes; set aside. 3. In a medium bowl, combine the sugars and cinnamon; set aside. 4. In a large bowl, combine the almonds, pecans, walnuts, and the Sriracha mixture until well combined. Stir in the sugar mixture until evenly coated. 5. Spread the coated nuts evenly onto the prepared baking sheet. Bake for 20 to 25 minutes, stirring once. 6. Let cool completely before serving. 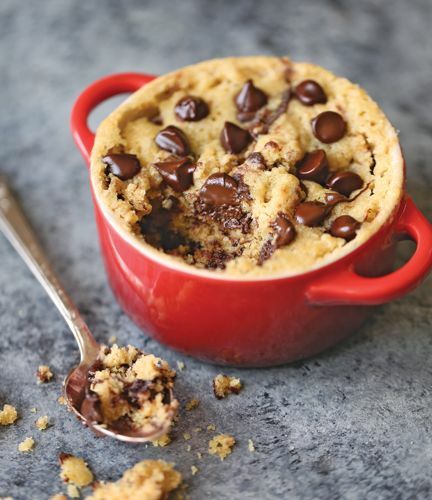 Now you can indulge in a single-serving cookie made in just 6 minutes—5 minutes of prep time (or less) and 60 seconds in the microwave. For a special treat, top off this cookie-in-a-mug with ice cream and a drizzle of hot fudge. You can make many different variations by adding white chocolate chips or a mix of almonds, pecans, or even macadamia nuts. Feel free to experiment! 1. In a 12-ounce mug or bowl, whisk together the butter, brown sugar, egg yolk, milk, and vanilla. Whisk in the flour, oats, baking powder, nutmeg, if desired, and the salt until well combined. Stir in the chocolate chips. 2. Put the mug in the microwave, and cook for 60 seconds on high or until the cookie has puffed up and a toothpick inserted in the center comes out clean (see Note). Serve immediately with a spoon. Note: Cooking times will vary depending on the power of your microwave. Continue microwaving the cookie in 15-second intervals, if necessary. This is my version of the Pizookie® from BJ’s Restaurant & Brewhouse. 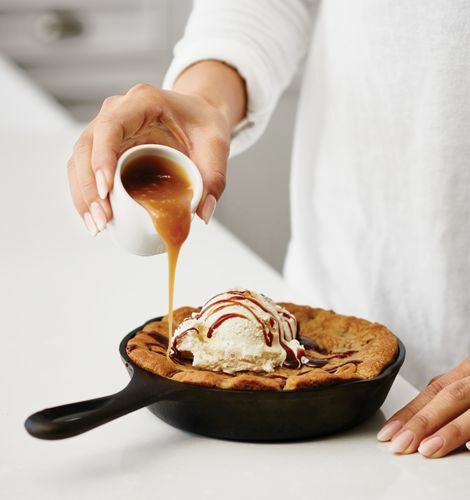 The warm freshly-baked cookie skillet topped with ice cream is so simple yet so good that I had to be able to have it at home. And you can’t beat the delicious cookie smell when it comes out of the oven. 1. Preheat the oven to 375°F. Lightly coat two 5-inch cast-iron skillets with nonstick spray. 3. Melt 10 tablespoons butter in a medium saucepan over medium heat. Cook, whisking constantly, until the butter begins to turn a golden brown, about 3 minutes. Remove from heat; strain through a cheesecloth or fine sieve. 4. Stir in the remaining 4 tablespoons butter until completely melted. Whisk in the sugars and vanilla until well combined. Whisk in the egg and egg yolk until well combined. Add the flour mixture, beating just until incorporated. Gently fold in the chocolate chips. 5. Divide the mixture into the prepared skillets. Bake until the edges are golden brown but the center is still moist, 12 to 15 minutes. 6. Serve immediately, topped with ice cream and drizzled with caramel sauce, if desired. These bad boys are perfect for any special occasion from birthdays to holidays. They are irresistible bite-sized cheesecakes for crying out loud! They also make for easy serving and portion control (for some, definitely not for me). 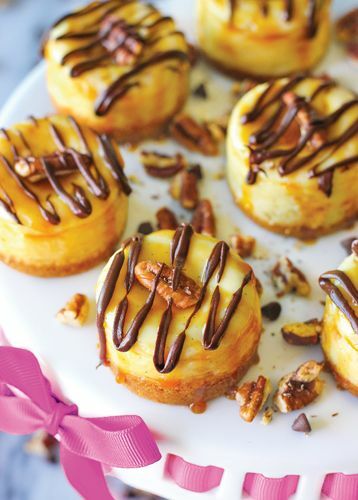 If you don’t have a mini cheesecake pan, a muffin tin will also work just fine. 1. Preheat the oven to 325°F. Lightly oil a mini cheesecake pan, or coat it with nonstick spray. 2. In a small bowl, combine the graham cracker crumbs and melted butter until a crumbly, moist mixture forms. Press 1 tablespoon of the crumb mixture into the bottom of each prepared cup; set aside. 3. In the bowl of an electric mixer fitted with the paddle attachment, beat the cream cheese and sugar until smooth, scraping the sides of the bowl and beaters as needed. Beat in the eggs, one at a time, until well combined. Beat in the vanilla and vanilla bean seeds until well combined. 4. Divide the filling evenly among the cups. 5. Bake until centers are almost set, 13 to 15 minutes. Let cool, and refrigerate for at least 2 hours. 6. Serve chilled, drizzled with caramel, melted chocolate, and pecan halves. I know, it’s impossible to say no to those adorable Girl Scouts when they set up shop and sell their cookies. 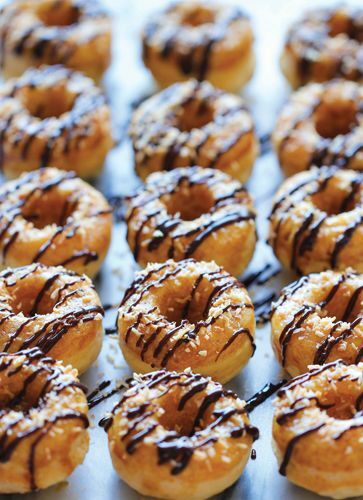 But even those girls can’t offer you this—a buttery donut with all the flavors of the Samoa cookies, with salted caramel, toasted coconut flakes, and melted chocolate. It’s perfection, really. 1. Preheat the oven to 425°F. Lightly oil a mini donut pan, or coat it with nonstick spray. 2. In a large bowl, combine the flour, sugar, cornstarch, baking powder, and salt. 3. In a small bowl, whisk together the milk, vinegar, butter, and egg. Pour it over the dry ingredients, and stir using a rubber spatula just until moist. 4. Scoop the batter evenly into the donut pan. Bake for 4 to 5 minutes, or until the donuts are slightly browned and spring back when touched. 5. Let the donuts cool for 10 minutes, and dip the tops into the salted caramel. Sprinkle with toasted coconut flakes, and drizzle with chocolate. 6. Allow the chocolate to set before serving.